This list breaks down the Interstate-Guide by states (and the District of Columbia) and including current, former, future and unsigned routes. Interstate mileage statistics provided for each state and D.C. were obtained from the December 31, 2018 Interstate Route Log and Finders List. Alabama | 12 active routes | 1,145.49 mi. Alaska | 4 active routes | 1,082.22 mi. Arizona | 6 active routes | 1,168.64 mi. Arkansas | 10 active routes | 747.12 mi. California | 12 active routes | 2,457.34 mi. Colorado | 5 active routes | 951.85 mi. Connecticut | 8 active routes | 346.17 mi. Delaware | 3 active routes | 40.61 mi. District of Columbia | 5 active routes | 12.27 mi. Florida | 12 active routes | 1,497.58 mi. Georgia | 15 active routes | 1,253.19 mi. Hawaii | 4 active routes | 54.91 mi. Idaho | 5 active routes | 611.76 mi. 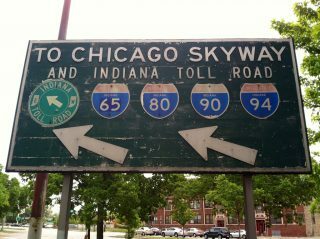 An original Interstate era sign directing motorists to the Chicago Skyway and the Northwest Indiana Interstate network. Photo taken by Jeff Royston (05/26/12). It was determined by the city of Chicago that the Chicago Skyway was never formally included in the Interstate Highway System in 1999. As such, trailblazers were posted in lieu of confirming markers along the toll road. 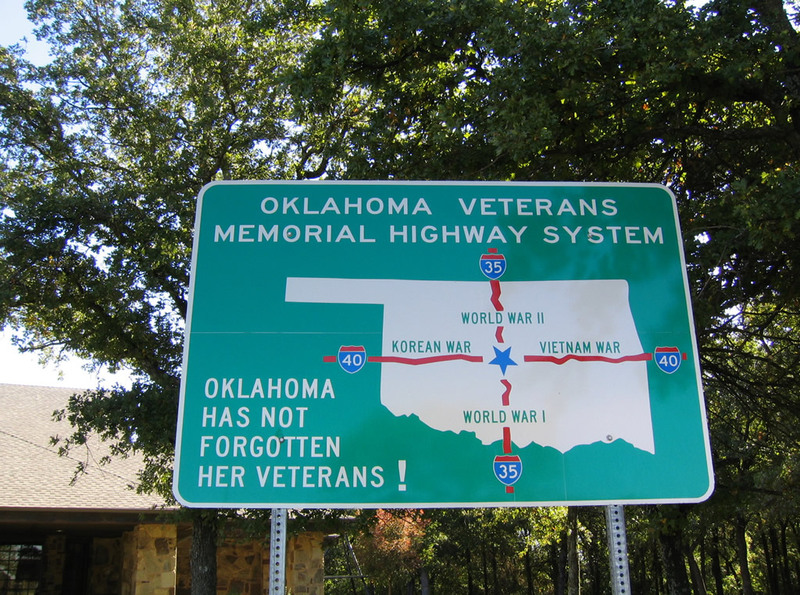 Oklahoma Veterans Memorial Highway System sign posted at the northbound welcome center near Thackerville. Photo taken 10/10/03. Interstates are commonly dedicated as war memorial highways throughout the United States. One such designation is the Purple Heart Trail, which originates at a monument in Mt. Vernon, Virginia. Purple Heart Trail routes include I-5 in California, I-35 in Texas and I-95 between Augusta and Holton, Maine. 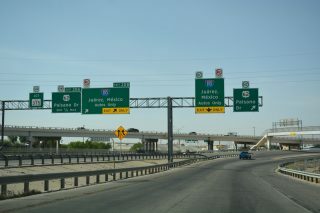 The south split of Interstate 110 and U.S 54 (Patriot Freeway) in El Paso, Texas. Photo taken 04/25/17. Prior to 2010, IH 110 was one of a handful of unmarked routes in the Interstate system. Illinois | 24 active routes | 2,203.42 mi. Indiana | 14 active routes | 1,306.52 mi. Iowa | 10 active routes | 781.24 mi. Kansas | 9 active routes | 874.34 mi. Kentucky | 11 active routes | 913.20 mi. Louisiana | 13 active routes | 933.84 mi. Maine | 5 active routes | 366.54 mi. Maryland | 16 active routes | 480.09 mi. Massachusetts | 13 active routes | 565.63 mi. Michigan | 13 active routes | 1,240.96 mi. Minnesota | 9 active routes | 912.73 mi. Mississippi | 9 active routes | 831.47 mi. Missouri | 18 active routes | 1,386.23 mi. Montana | 5 active routes | 1,191.23 mi. Nebraska | 6 active routes | 481.66 mi. Nevada | 6 active routes | 623.79 mi. New Hampshire | 5 active routes | 224.54 mi. New Jersey | 10 active routes | 431.36 mi. 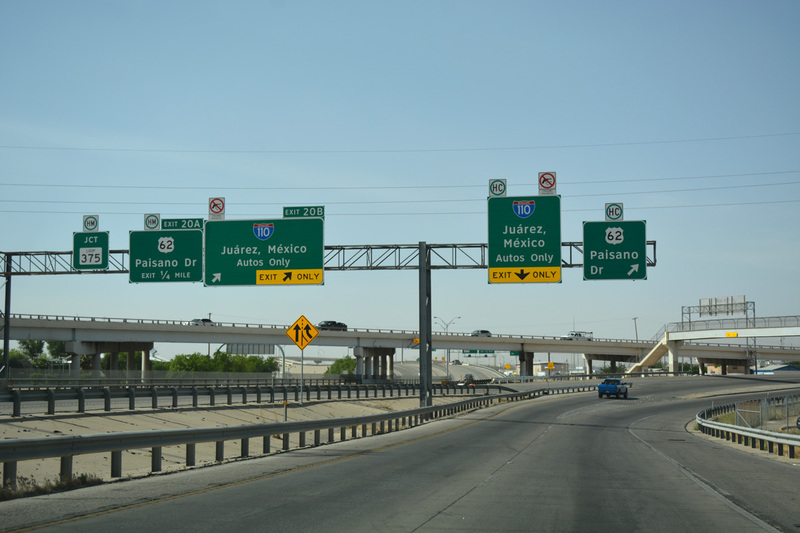 New Mexico | 3 active routes | 999.90 mi. New York | 31 active routes | 1,730.34 mi. North Carolina | 19 active routes# | 1,337.30 mi. North Dakota | 3 active routes | 571.13 mi. Ohio | 21 active routes | 1,572.35 mi. Oklahoma | 7 active routes | 930.16 mi. Oregon | 6 active routes | 727.41 mi. Pennsylvania | 23 active routes## | 1,862.21 mi. Puerto Rico | 3 active routes | 249.77 mi. Rhode Island | 3 active routes | 68.53 mi. South Carolina | 11 active routes | 850.80 mi. South Dakota | 4 active routes | 678.31 mi. Tennessee | 17 active routes### | 1,959.54 mi. Texas | 25 active routes | 3,501.15 mi. Utah | 5 active routes | 938.00 mi. Vermont | 4 active routes | 320.22 mi. Virginia | 16 active routes | 1,117.23 mi. Washington | 7 active routes | 763.67 mi. West Virginia | 7 active routes | 549.05 mi. Wisconsin | 7 active routes | 741.80 mi. Wyoming | 4 active routes | 913.60 mi. ### – The remainder of I-181 was renumbered as an extension of I-26 in 2005.